Transcript: These are DuraClip Report Covers! They have a sliding clip on the side that holds your pages in place. With a colored back cover and a clear front cover, holding your loose pages is simple. Slide up to 30 pages into the edge of the report covers then slide the clip back into place. Your pages are now non-permanently held in place. Use it like a traditional book, but at any time you can remove the pages and reorganize and add as needed. 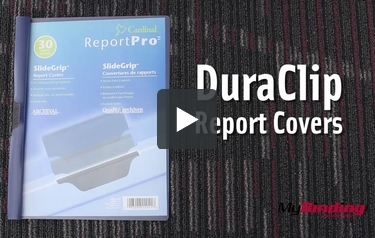 These are DuraClip Report Covers! Here is a full look at the covers.